Futurama is one of my all time favorite television shows. The robot character Bender isn't my favorite character on the show, but he seems to be quite popular with every other fan of the show. 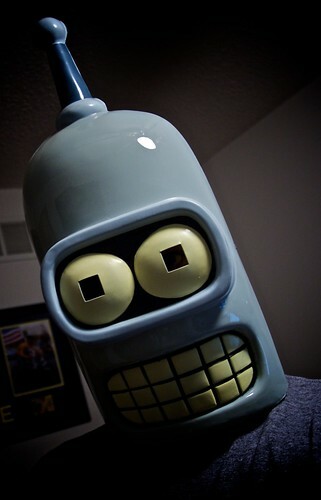 I was able to score this Bender halloween mask from emerchandise.com in 2002 for $7 and it has served as my de facto Halloween costume many times since then. It's hard to believe you're going to be a dad! Do you also have a Bart Simpson toothbrush?